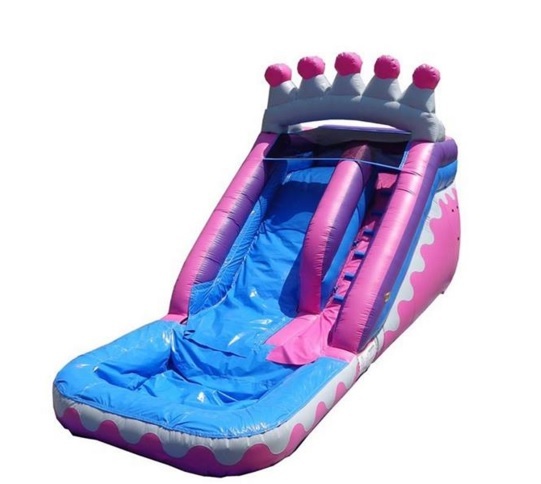 14 Foot Princess Water Slide this water slide combines pretty in pink for every princess. It is guaranteed to bring excitement to the kingdom at any event or festival or party. This Slide has a pool at the end of the slide. Renter must provide hose to unit and water hookup. This needs a Standard household outlet to plug into. Can be setup on Dirt, Grass, Rock, Concrete, or Asphalt. This is For ages 14 and under. Waterslides are not allowed in any County or City Parks.